RISD Glass welcomes Alexandra Foradas, a curator specializing in modern and contemporary art and interested in systems, meaning-making and knowledge transmission, and the relationship between museums and performance. 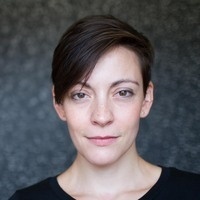 Foradas is currently associate curator at MASS MoCA in North Adams, MA, where she has curated and co-curated solo exhibitions by Taryn Simon (2018), Jenny Holzer (2017), Janice Kerbel (2017) and Gunnar Schonbeck (2017), as well as the group exhibition Bibliothecaphilia (2015). Upcoming projects include an exhibition of work by contemporary artists addressing translation (2020). She has also curated and juried several exhibitions in the region, including at Eclipse Mill (North Adams, MA), Collar Works (Troy, NY) and the Thorne-Sagendorph Art Gallery (Keene, NH).